People who suffer from depression may want to look to yoga as a complement to traditional therapies as the practice appears to lessen symptoms of the disorder, according to studies presented at the 125th Annual Convention of the American Psychological Association. "Yoga has become increasingly popular in the West, and many new yoga practitioners cite stress-reduction and other mental health concerns as their primary reason for practicing," said Lindsey Hopkins, PhD, of the San Francisco Veterans Affairs Medical Center, who chaired a session highlighting research on yoga and depression. "But the empirical research on yoga lags behind its popularity as a first-line approach to mental health." Hopkins' research focused on the acceptability and antidepressant effects of hatha yoga, the branch of yoga that emphasizes physical exercises, along with meditative and breathing exercises, to enhance well-being. In the study, 23 male veterans participated in twice-weekly yoga classes for eight weeks. On a 1-10 scale, the average enjoyment rating for the yoga classes for these veterans was 9.4. All participants said they would recommend the program to other veterans. More importantly, participants with elevated depression scores before the yoga program had a significant reduction in depression symptoms after the eight weeks. "The more the participants attended yoga classes, the lower their depressive symptoms at the end of the study," said Nyer, who currently has funding from the National Center for Complementary and Integrative Health to conduct a randomized controlled trial of Bikram yoga for individuals with depression. Elsewhere at the meeting, Nina Vollbehr, MS, of the Center for Integrative Psychiatry in the Netherlands presented data from two studies on the potential for yoga to address chronic and/or treatment-resistant depression. In the first study, 12 patients who had experienced depression for an average of 11 years participated in nine weekly yoga sessions of approximately 2.5 hours each. The researchers measured participants' levels of depression, anxiety, stress, rumination and worry before the yoga sessions, directly after the nine weeks and four months later. Scores for depression, anxiety and stress decreased throughout the program, a benefit that persisted four months after the training. Rumination and worry did not change immediately after the treatment, but at follow up rumination and worry were decreased for the participants. 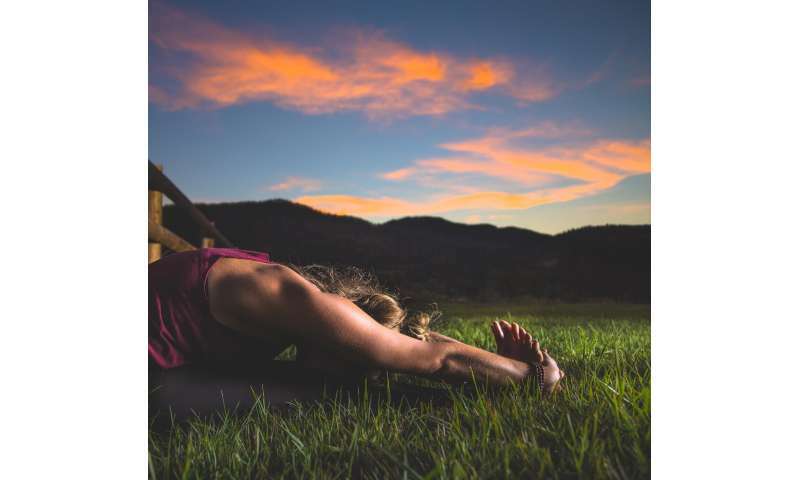 "These studies suggest that yoga-based interventions have promise for depressed mood and that they are feasible for patients with chronic, treatment-resistant depression," said Vollbehr. Hopkins noted that the research on yoga as a treatment for depression is still preliminary. "At this time, we can only recommend yoga as a complementary approach, likely most effective in conjunction with standard approaches delivered by a licensed therapist," she said. "Clearly, yoga is not a cure-all. However, based on empirical evidence, there seems to be a lot of potential." More information: Session 1301: "Effects of a Hatha Yoga Intervention on Depressive Symptoms in Male Military Veterans," "Effects of a Hatha Yoga Intervention on Depressive Symptoms: Mediating Roles of Mindfulness and Self," "Hyperthermic Yoga for the Treatment of Depressive Symptoms" and "Heated Yoga for the Treatment of Anxious Depression," Symposium, Thursday, Aug. 3, Room 152A, Street Level, Walter E. Washington Convention Center, 801 Mount Vernon Pl., N.W., Washington, D.C. Session 2090: "The Influence of Yoga on Chronic Depression and Potential Cognitive Mediators," Paper Session, Friday, Aug. 4, West Overlook Room, Level 2, Walter E. Washington Convention Center, 801 Mount Vernon Pl., N.W., Washington, D.C. Session 2258: "Multidisciplinary Collaboration in Creating a Yoga Protocol to Complement Evidence-Based Care," Poster Session, Friday, Aug. 4, Exhibit Halls D and E, Level 2, Walter E. Washington Convention Center, 801 Mount Vernon Pl., N.W., Washington, D.C.